The Mexican people have become fed up with corruption and have stormed the National Palace in Mexico City. We may be witnessing the birth of a revolution and subsequent bloody civil war. I've been watching Mexico for some time now while the rest of the world was losing its mind. These killings feel to me like a spark. Bloody Civil War you say? What would we call the events since the failed 2006 War on Drugs which has killed more than 100,000 people and remains the world's second worst ongoing conflict? Anyways the corruption in Mexico is astounding and the country is beyond any hope as far as I am concerned. Hmm, keep an eye on that then? Ohoho. You think that farce was bloodflooded? A civil war in Mexico would destabilize the whole continent. If the supply of drugs is cut off or changes hands... oh boy. Surely the Zapatistas would feel a wave of fresh water rushing into their movement. I'd say 100,000 dead would be the lowest, most optimistic prediction. The US wouldn't let a hostile nation spring forth at their southern border. Also the world's largest source of gruesome liveleak execution videos. Islamic terrorists could and can not match the gruesomeness of cartel executions and torture. Some truly fucked up people those cartel guys are. The whole case was pretty big on Reddit. They even found another, wholly separate mass grave entirely by accident. As a comment said, "Nothing exists outside America unless we're bombing it." is this really just a mexico thing though? It's my understanding that much of the bruhaha over the influx of children over the southern border of the USA was children from various nations fleeing the destablized countries struggling with corrupt governments, drug cartels and roving gangs of revolutionaries. Makes me wonder if these areas are likely for some border rearangments soon. It really looks like a whole lot of something big changing soon. That's what I mean. The coming civil war will put the previous one to shame. Or it'll be an ultraviolent escalation. Protesters over missing students in Mexico burn state assembly: Demonstrators set fire to the local legislature building on Wednesday in the capital of the southwestern state of Guerrero in protests over the apparent massacre of 43 students by corrupt police and thugs from drug gangs. CHILPANCINGO, Mexico - Demonstrators set fire to the local legislature building on Wednesday in the capital of the southwestern state of Guerrero in protests over the apparent massacre of 43 students by corrupt police and thugs from drug gangs. Violent demonstrations rocked several other states, where protesters blocked an airport and damaged the local office of President Enrique Pena Nieto's ruling Institutional Revolutionary Party (PRI). In a televised press conference on Friday, Mexico’s Attorney General, Jesús Murillo Karam, announced that the forty-three missing students from the Ayotzinapa Normal School had been executed and incinerated in the municipal dump of Cocula. He added one important qualification: the fragmented remains were too badly burned to permit any quick forensic confirmation of what the Attorney General was presenting, in macabre detail, as fact. Many people in Mexico City told me that they were in tears before the conference was over. The writer and musician Juan Carlos Reyna said that the news conference made him feel “like all of Mexico was being asphyxiated.” He was not alone. 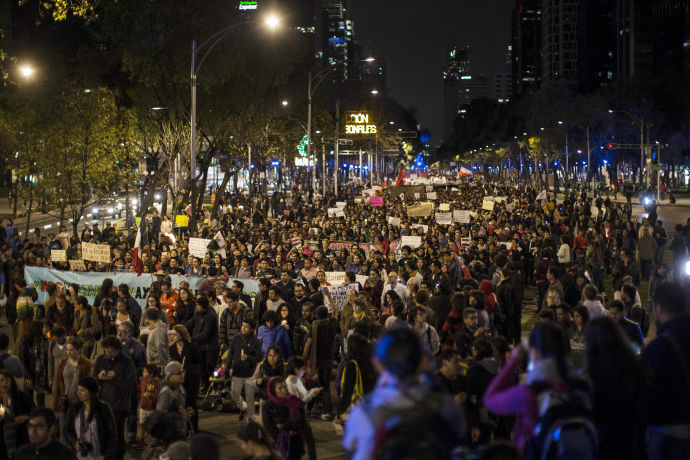 That evening in Mexico City, hundreds of people walked over to Avenida Reforma to sit on the steps of the monument known as El Ángel to clear their heads, take deep breaths of the fresher evening air, and share their thoughts. A slogan for Mexico’s civic movement was born that night. Murillo Karam had ended his press conference by saying, “Ya me cansé,”—“I’m finally tired” or, more colloquially, “I’ve had enough.” By the end of that night, #YaMeCansé was spreading on social networks, summoning people to a march in Mexico City the next night: #YaMeCanséDelMiedo. I’ve had enough fear. Murillo Karam announced, during his press conference, that this new information was the result of testimony gathered just that week from three recently captured young members of the cartel Guerreros Unidos, which traffics heroin to the United States. The three captured delinquents were known as “El Pato,” “El Jona,” and “El Chereje.” According to Murillo Karam, the Iguala municipal police who detained the Ayotzinapa students had turned them over to Guerreros Unidos in the early-morning hours of September 27th, shortly after the police and other gunmen had already killed three students, as well as three other bystanders, in a series of armed attacks in Iguala during the previous night. The initial attacks, and everything that happened after, were allegedly carried out on the orders of the then mayor of Iguala, José Luis Abarca, who became a fugitive for about a month, until he was finally captured last week, along with his wife, in an abandoned-looking house in a working-class Mexico City barrio. "Crises in Mexico: Protests of the missing 43 became protests of the missing 1000s; Government blames cartels, cartels blame government." You know the sad part is I don't know who to believe. "Ya me cansé," "Enough, I’m tired." The remark has been taken up by protesters who see the attack in Iguala as part of the systematic failure by the state. Filmmaker Natalia Beristáin was among hundreds who posted videos with the hashtag #YaMeCanse. NATALIA BERISTÁIN: [translated] Señor Murillo Karam, I am Natalia Beristáin, and I, too, am tired. I’m tired of disappeared Mexicans, of the femicides, of the dead, of the decapitated, of the bodies hanging from bridges, of the broken families, of the mothers without children, of the children without parents. I’m tired of the political class that has kidnapped my country and of the class that corrupts, that lies, that kills. I, too, am tired. Hold onto your asses, because the situation is beginning to head south. It's no longer just hundreds, but several tens of thousands of protestors, and the US Embassy has just put out a travel warning. Samuel Huntington once remarked that Mexico had become quiet after the success of the ruling PRI party largely because the people were simply worn out by all the violence. The result was a somewhat more orderly society. It would seem that now the people are worn out by all of that order, and our now ready to make demands of their leaders. A big question is how will their leaders respond to those demands. Characters of the revolution. With the continuing turmoil on our southern border, we need to take border security seriously. As long as Mexico remains unstable, it will pose a threat to the U.S. as well. In any event, the events in Mexico need to be watched carefully because they may have an impact on American national security. The author sounds like a wanker. My first thought was that the US shares responsibility for Mexican instability and that we should prepare to provide direct humanitarian aid and follow up with a long term recovery assistance.